I got transferred by ambulance from University of Colorado Hospital to Children's Hospital Colorado next door at about 11a on Wednesday, May 29. I had been a patient at UCH since about 2am on Monday, May 27 when my water broke. The ambulance over was a bit of overkill but it was necessary for liability purposes. The Maternal Fetal Care Center at Children's was closed this week, which means that everybody had to bend over backwards to accommodate this delivery. An entire team had to be assembled and we were the only family in the whole huge ward. Apparently, the lack of staffing made it extremely difficult for any of the many waiting family members to get in and out of our waiting area, which was directly adjacent to the pre/post op space. Everything was prepped and perfectly prepared so the surgery started almost exactly at one. Everybody was really wonderful and supportive and the doctors even gave Q a little bit of an anatomy lesson as they worked through the layers to get to the baby girl. I think it's very cool that Q thought it was interesting and didn't feel like losing his lunch. After seeing the pushing and pulling required for a c-section, he was extremely sympathetic to how sore I would be the next day. At 1:18p, Clarity Elise Hartman was born at 35 weeks, 4 days gestation. Quentin took the picture of her coming out and then quickly followed her and her team to the next room so he could watch and get pictures while I got sewn up. They got her all cleaned up, intubated her, and placed all her lines. When she was stable enough for the move to the NICU, they brought the bassinet up next to my bedside for a quick look before whisking her away. After being wheeled back to the recovery area, I was able to spend about an hour regrouping as we waited for the spinal to wear off. I was feeling pretty good until we got moving onto the transport back to UCH. On the transport, as the anesthetic was wearing off, I wasn't in pain but started feeling extremely tired and disoriented. The rest of the afternoon and evening for me are quite a bit of a blur. I felt sleepy and hot and clammy. Apparently, even though I felt hot, my body temperature was low and refused to come up. 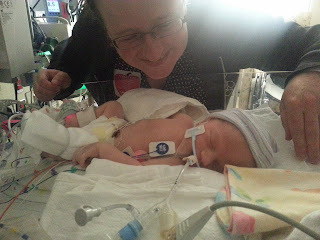 Thankfully, Mom was able to stay with me while Quentin stayed at Children's, in a sleep room just a few steps from Clarity if he was needed. I finally got a few hours of uninterrupted sleep after midnight and something about that reset me. I woke up feeling like a fever had broken and all my vitals were back to normal. 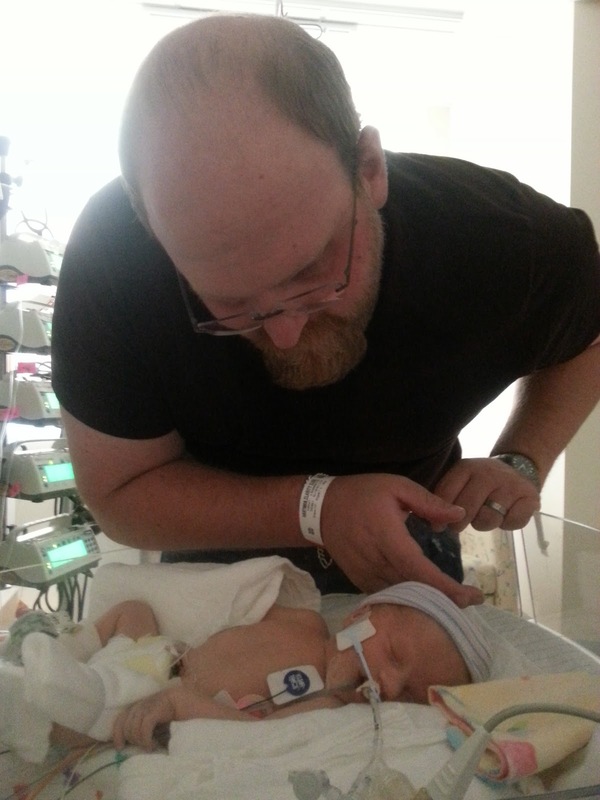 Later that evening, we were able to find out that she weighed 4 pounds, 11 oz. 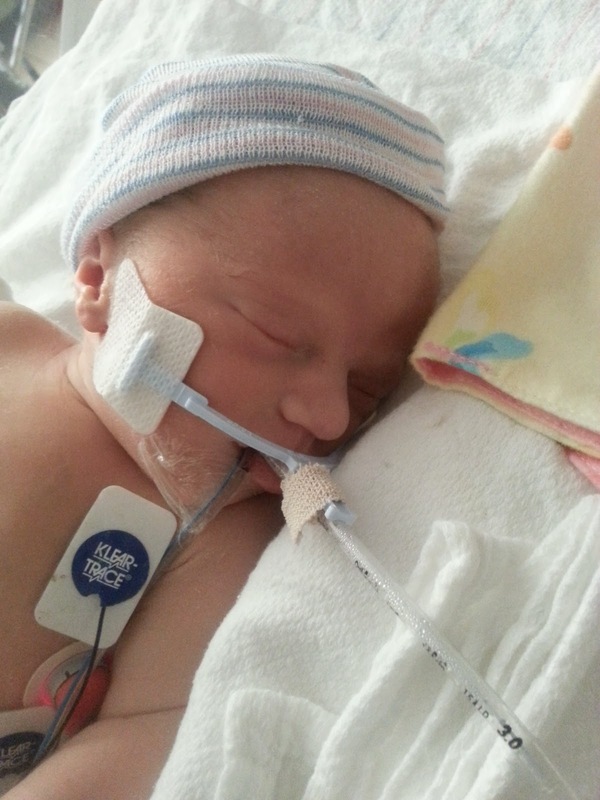 at birth and is 16.25" long. I think that the pictures can't really give the scale for how tiny that is. They spent today, May 30, slowly adjusting settings to accommodate what she "likes" and keep her numbers steady. In the picture above, she's lying on the table at the center. 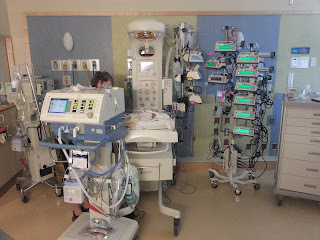 Her ventilator is sitting in the left foreground (with Mom standing behind it where she can look at Clarity's face). The bank of boxes with green glowing screens on the right are her medicine pumps. They deliver things like an IV but with an extremely high amount of precision. They also deliver the drugs in a very steady, slight amount by verrrrry slowly emptying a syringe rather than in "drips". I was able to get over to Children's in a wheelchair today to see her. The trip was a bit much and I came back exhausted but it was very much worth it. We even got to give her "oral care". They place a little colustrum on a cotton swab and we gently rub it onto the surfaces on the inside of her mouth. It is absorbed there and allows her to get some of the immunity boosting benefits of that liquid gold even though she can't take oral nutrition right now. It's intimidating putting anything into such a tiny little mouth around all of the tubes. My mom and Q's parents made it over to visit her today. Q's sister watched Wil for most of the day so Mom could take care of me but then I got to see Willow for about an hour in the late afternoon when Mom brought her to the hospital. Luckily, she's totally comfortable with all of the family who has been watching her but it makes me sad that I haven't been able to give her much time and attention this week. Unfortunately, there's something about the surroundings that is making her a little unsure about me right now. She won't snuggle on the hospital bed with me and I'm not physically able to get in very many positions down at her level to play. I also can't really hold her. Once again, I'm so grateful to have so many family members who she knows and trusts. They have come together as an amazing support team over the four days we've been at the hospital. Among both sets of our parents and siblings, they have managed to keep the cats fed and new seedling garden watered at our house as well as providing a stable network for Willow. Hopefully, I can visit Clarity again tomorrow but I'm not going to push to have them discharge me just yet. Even though I'm feeling great, I don't want to overdo it and end up unwell and miserable. 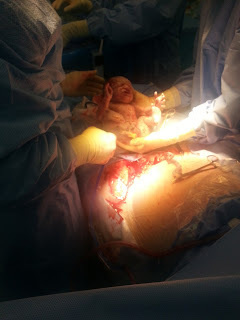 Even today, everyone couldn't believe how well I was doing less than 24 hours after a c-section. Patience is not something I do well but I hope I'm able to admit when it is something I need to reconcile myself to. There's not a lot to do for her over there right now anyway. I sang and talked to her and stroked her head and arm but she just needs to stay sedated and sleeping to get big and strong. I didn't get it posted here, but we've also got a picture of her without her cap. She's got so much hair! I also think she has Quentin's nose. We're still in the "honeymoon" period and I'm trying not to get too optimistic but we just need to keep hanging on to this trajectory and she'll pull through. We all know that the rollercoaster ride is just beginning though. This is stunning! I am passed up the type of this astounding.I've perused a great deal of articles, this really is one of the best ones that I've perused. Keep on providing more articles this way.